Book Review: 'Arbitrary Stupid Goal,' By Tamara Shopsin Tamara Shopsin's quirky, lively memoir of her unconventional Greenwich Village childhood is packed with vivid details about the cast of characters who populated her parents' corner store-turned-diner. Don't let Tamara Shopsin's Thurberesque cover drawing of a helmeted girl in cleats kicking right through a football mislead you. 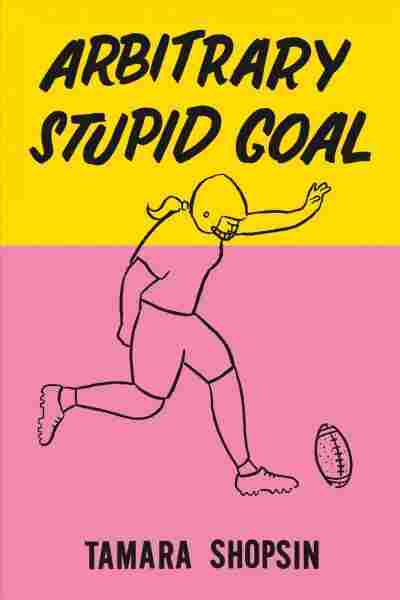 Arbitrary Stupid Goal is not about football. It isn't about any sport — except, perhaps, smashing grand life goals to smithereens. Shopsin, a graphic designer, illustrator, and part-time cook in her family's eponymous New York restaurant, has concocted a refreshingly quirky, non-linear memoir about her unconventional upbringing in and around what was then her parents' old-fashioned corner grocery store in Greenwich Village. Over time, the shop mutated into an eccentric greasy spoon joint with some 900 items on the menu, all cooked to order — including such delicacies as Cheeseburger Soup. Regular customers included John F. Kennedy, Jr., who was allowed to glide in on Rollerblades, John Belushi, who sometimes slept in its rocking chair with a paper towel roll as a pillow, and Calvin Trillin, who risked expulsion from the publicity-averse establishment by writing about it in The New Yorker. Arbitrary Stupid Goal is an ode to unconventionality and an elegy to Greenwich Village in the 1970s and '80s, which was crime-riddled but also "a very tolerant place." Shopsin reminds us that the Village used to attract "fringe people," whom she was brought up to believe were "the nutrients of New York City." After describing a period when what the family still calls "The Store" was robbed regularly — including twice in one day — she comments, "It is easy to cite the bad in the filthy chaos of New York before luxury condos. It is harder to express the spirit, life, and community that the chaos and inefficiency bred." That "spirit, life, and community" are exactly what Shopsin conveys in this rich smorgasbord of memories, beginning with her parents' relaxed philosophy of child-rearing. She and her four siblings "played in traffic ... stayed up late, ate with our hands, cursed, never brushed our teeth, drank soda like it was water, and hung out at gay bars," she writes. They also helped out by clearing tables, grating cheddar, and pulling chicken and turkey off the bone. "None of us thought of working at The Store as a chore." The only ironclad rule was to stay away from the Hobart meat slicer, which produced enticing "toilet paper thin slices of meat." All five made it to adulthood with all ten digits intact. Shopsin deliberately saves her explanation of the book's odd title until the end, so I'll just say that it refers to her father's core belief that life — and mortality — are essentially the pits, and pointless to boot, so you have to devise ways to cope and live in the moment. Shopsin and her twin sister were born in 1979, the same year 6-year-old Etan Patz was kidnapped on his way to school in the Village. "It changed the lives of most parents in New York City," she notes, but not hers, who held fast to their belief in raising free-range, fearless kids. After hot breakfasts prepared to order by their father — dinosaur-shaped chocolate chip pancakes for her brother, grits and poached eggs for her — she and her siblings walked themselves to the same school Patz had attended. Shopsin's portraits of her inimitable, larger-than-life father, Ken, and his dear friend, Willy, form the heart of this book. Willy was a fixture at The Store, an honorary granddad, mixed-race womanizer, con artist, and nightclub singer with "a deep voice made for singing 'Old Man River'... like Paul Robeson's, only softer. But just as powerful and sad." It was Willy who taught Ken Shopsin to curse, and he did such a good job that the irascible proprietor was considered a psycho by some. "If you didn't belong in the Store, you were kicked out .. He could do more harm with one sentence than most people could do with a crowbar," his daughter writes. His many policies included no parties of more than four, and no copying neighboring table's orders, because he hated making the same thing twice "'Leave now, you'll be early' was my dad's response to customers who said they were in a hurry," she adds. In keeping with this philosophy, Shopsin has written a loose narrative whose half-blank pages meander through some of the things that have given her life joy and meaning — including memories of her gentle mother, Eve, who died when she was 23, a visit to James Thurber's house in Columbus, Ohio with her boyfriend (now husband), and the history of The New York Times crossword puzzles, to which her father has contributed. "It might not add up in a neat package but these are the things I remember," Shopsin writes. Rest assured that Arbitrary Stupid Goal is actually neither arbitrary nor stupid.